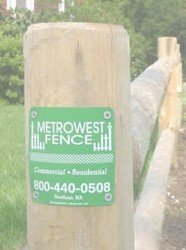 MetroWest Fence, Inc. is locally owned and operated,and has been serving metropolitan Boston for over 25 years. Our guaranteed workmanship has added distinction - privacy - and security to hundreds of homes, businesses, government and industrial sites. MetroWest offers expert installation of Commercial, Residential and Recreation Fencing. MetroWest Fence remains dedicated to providing quality materials, labor and professional service at competitive prices. MetroWest Fence carries a complete line of vinyl, wood, ornamental aluminum, and chain link fences to meet every need. 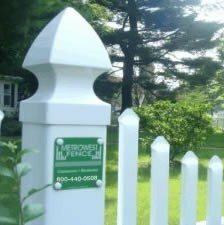 MetroWest is proud to use Kroy Fencing for our vinyl fences and railing with traditional privacy and picket styles, These fences are maintenance free in respect to painting, and they carry a lifetime warranty. They are available in a variety of designs and heights. Kroy Building Products is extremely flexible in the designs for all your fencing needs. Our high quality cedar wood fences are manufactured on our premises. With over 25 years of experience and the premium grade materials we use to construct your fence, means you get a great looking and long lasting fence. All of our custom wood fencing is made with, 2 x 3 "husky" cedar back rails.